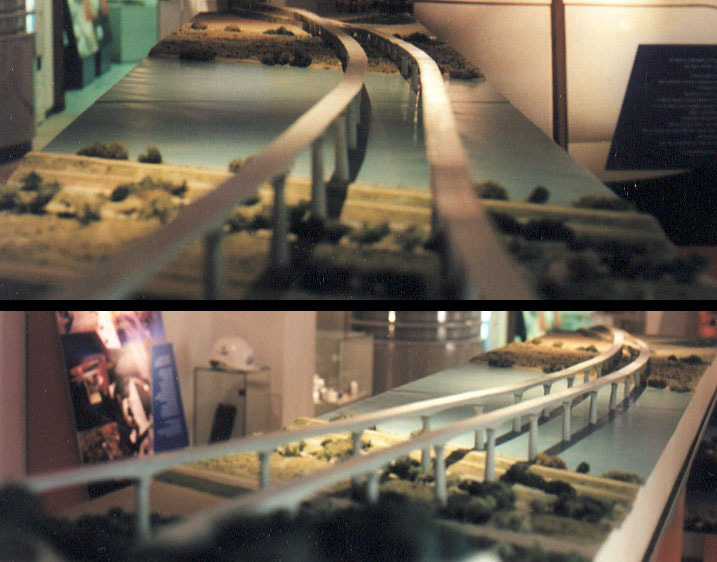 A model of the twin bridges at Avignon, where the LGV Méditerranée high speed line splits into two branches going to Montpellier and Marseille. Two of the legs of the the "Triangle des Angles" cross the Rhône river, with two tracks each, on the Viaduc des Angles bridges. June 1997 photo. 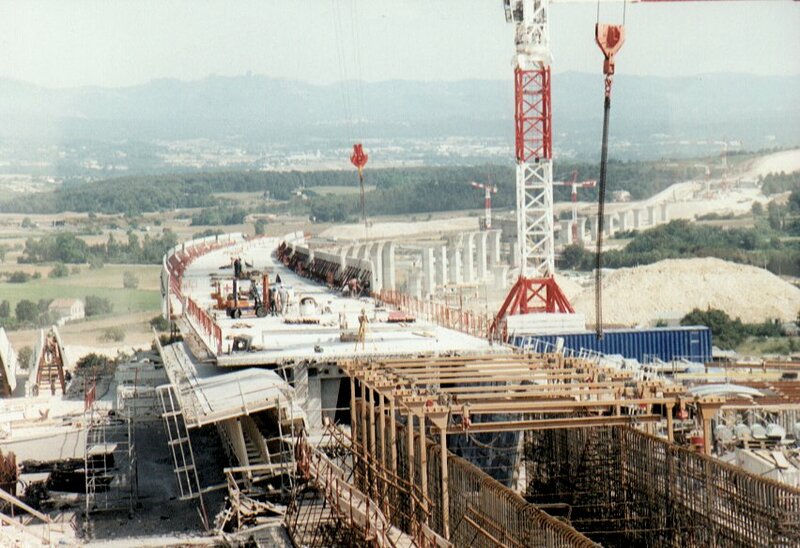 Construction of the Viaduc des Angles bridges near Avignon. 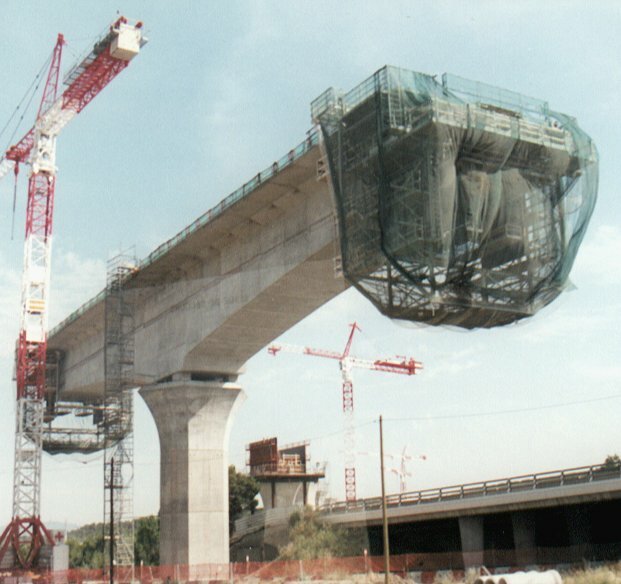 Pre-fabricated sections of the bridge can be seen at right, and in the distance the crane that emplaces these segments is visible riding on top of the bridge. 1999 photo. 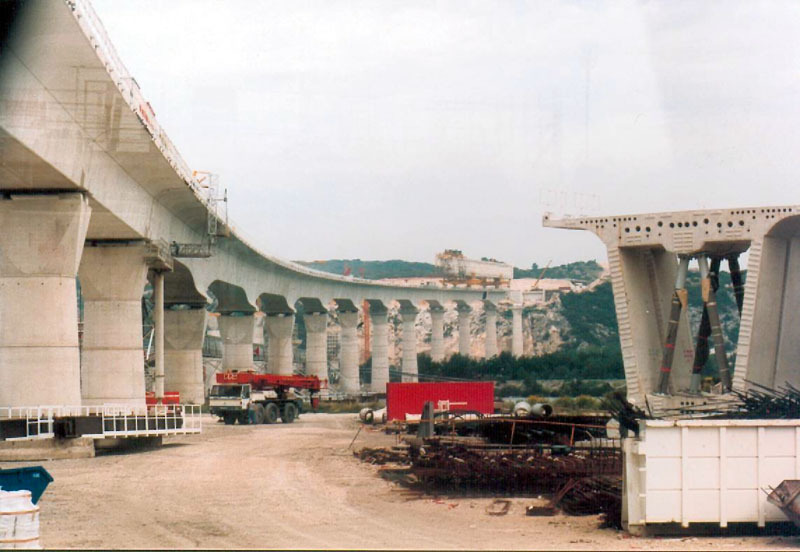 Construction of the Viaduc des Angles bridges near Avignon. 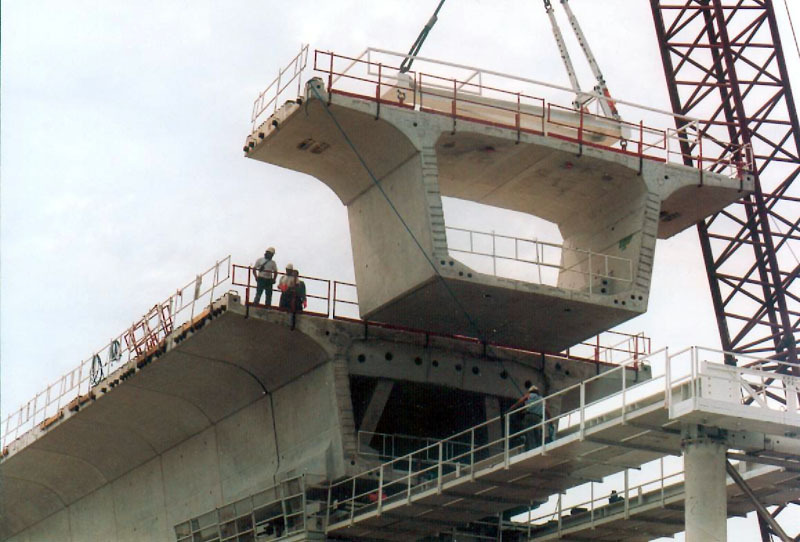 Pre-fabricated sections of the bridge approaches are emplaced by a crane. 1999 photo. 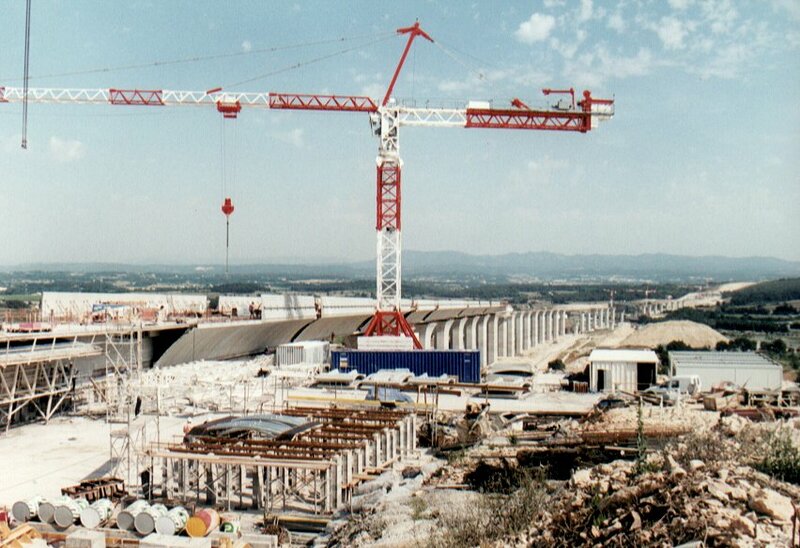 Construction of the Viaduc des Angles bridges near Avignon. 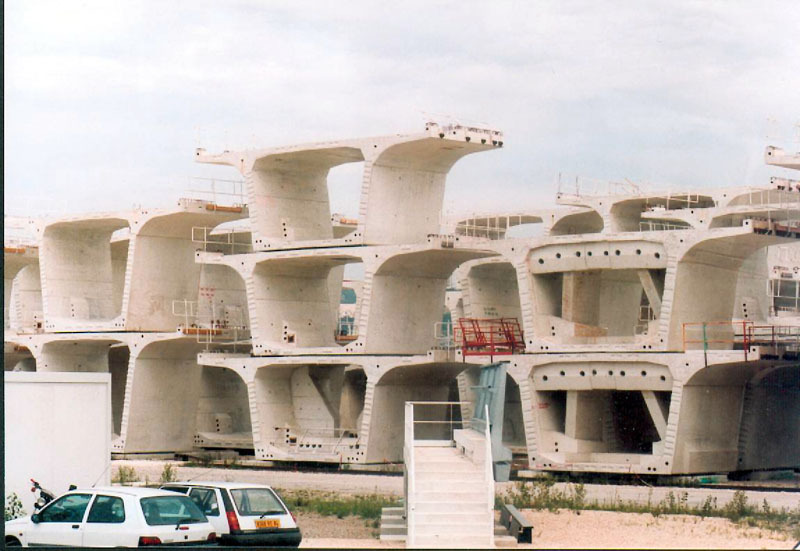 Pre-fabricated sections of the bridge are stacked awaiting emplacement. 1999 photo. 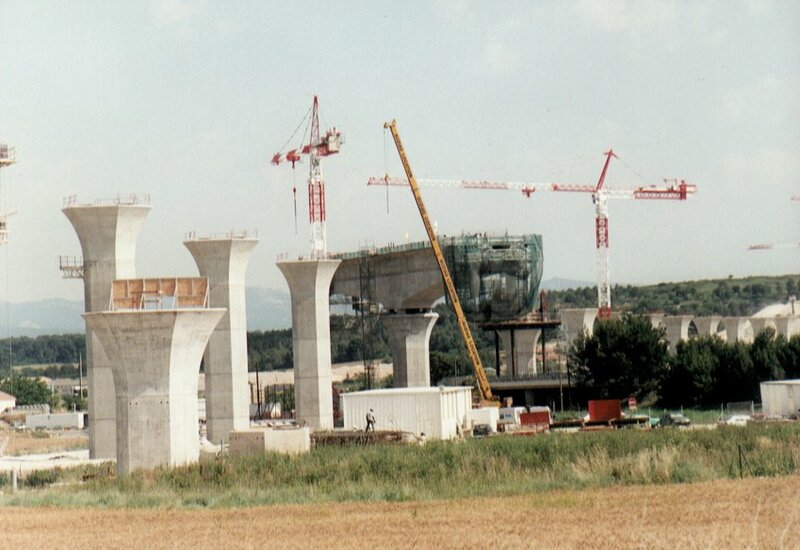 Construction of the Viaduc de Mornas near Avignon. 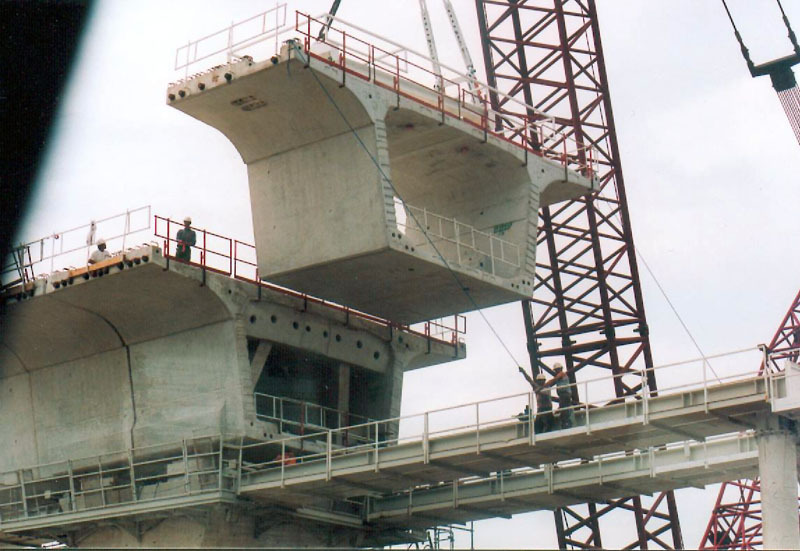 Pre-fabricated sections of the bridge are assembled prior to being emplaced. 1999 photo. 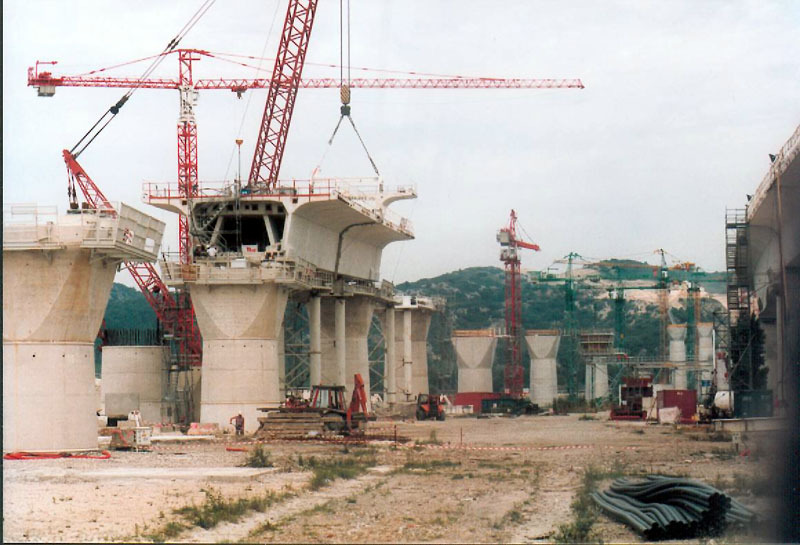 Construction on the LGV Méditerranée high speed line southeast of Avignon. A 356m bridge crossing the A7 highway, followed by the 303m Bompas tunnel, are used to skirt the 12th century Chartreuse de Bompas. 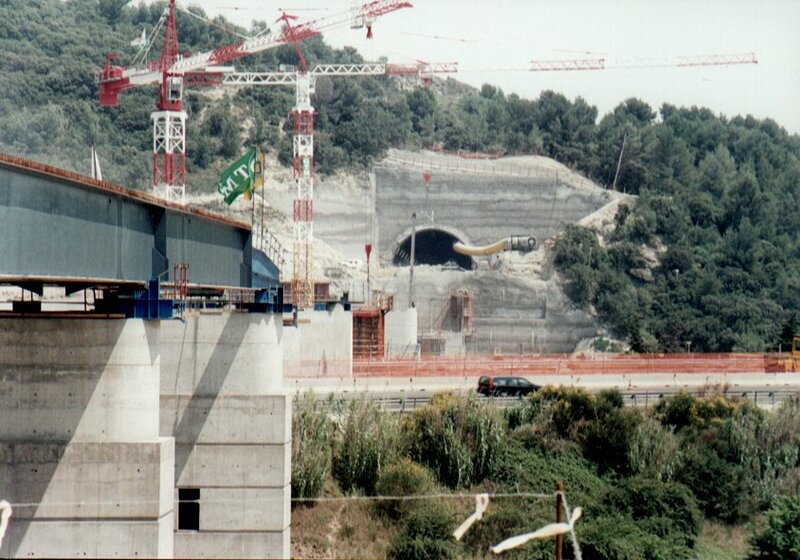 Note how the tunnel is being dug in two layers; only the top half has been excavated in this June 1997 photo. 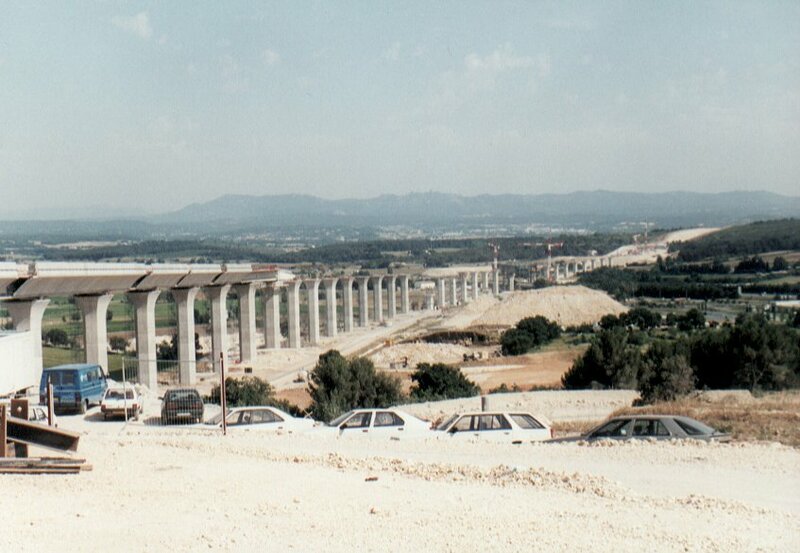 The Ventabren bridge under construction west of Aix-en-Provence. This is the longest bridge on the new LGV Méditerranée high speed line, at 1730m and 36 pilings. June 1997 photo. Another view of construction on the Ventabren bridge. June 1997 photo. 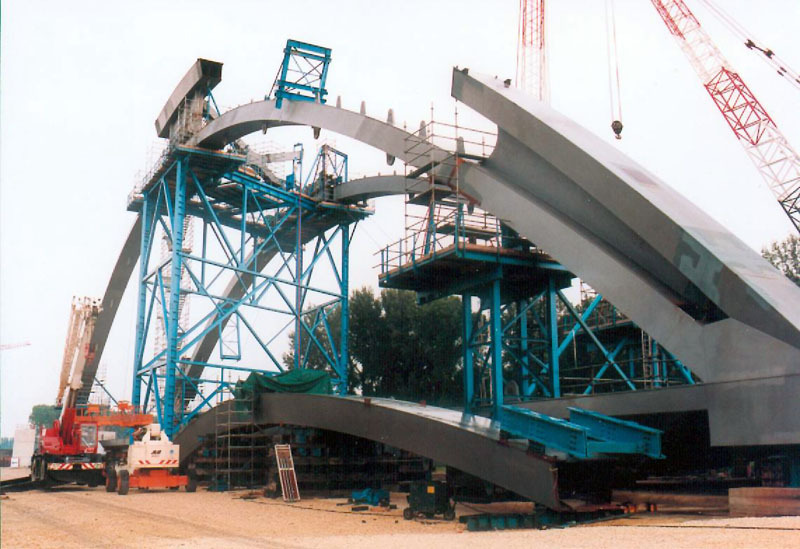 Another view of construction on the Ventabren bridge. This bridge crosses a highway; in order not to close the busy highway during construction, the bridge section shown here was built parallel to it. Later it was pivoted into its final position across the highway. June 1997 photo. Another view of the entire Ventabren bridge work site. June 1997 photo. Track work on the LGV Sud-Est high speed line, as seen from the cab. Just ahead is an area where a high speed crossover is being changed. 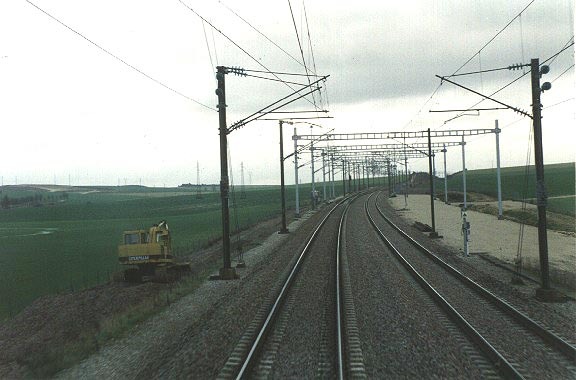 By some lack of foresight, the clearance for removing the turnouts was not accounted for when the catenary masts were installed, which explains why the wide gantries ahead replaced them before work could begin. These gantries provide adequate clearance at right to accomodate an entire panel turnout. 1996 photo.